In this week’s study from Tehillim / Psalms 122:1-9, the psalm opens saying, א שִׁיר הַמַּעֲלוֹת לְדָוִד שָֹמַחְתִּי בְּאֹמְרִים לִי בֵּית יְהֹוָה נֵלֵךְ: A song of ascents. Of David. 122:1 I was glad when they said to me, ‘Let us go to the house of the Lord.’ (NASB) David speaks of the joy of going to the house of the Lord. Why is the house of God joyful? He continues saying, א שִׁיר הַמַּעֲלוֹת לְדָוִד שָֹמַחְתִּי בְּאֹמְרִים לִי בֵּית יְהֹוָה נֵלֵךְ: ב עֹמְדוֹת הָיוּ רַגְלֵינוּ בִּשְׁעָרַיִךְ יְרוּשָׁלָם: ג יְרוּשָׁלַם הַבְּנוּיָה כְּעִיר שֶׁחֻבְּרָה-לָּהּ יַחְדָּו: ד שֶׁשָּׁם עָלוּ שְׁבָטִים שִׁבְטֵי-יָהּ עֵדוּת לְיִשְֹרָאֵל לְהֹדוֹת לְשֵׁם יְהֹוָה: 122:2 Our feet are standing Within your gates, O Jerusalem, 122:3 Jerusalem, that is built As a city that is compact together; 122:4 To which the tribes go up, even the tribes of the Lord An ordinance for Israel To give thanks to the name of the Lord. (NASB) What is the significance of standing within the gates of Jerusalem? What is it about this holy city that is so attractive to all peoples? David says, כִּי שָׁמָּה | יָשְׁבוּ כִסְאוֹת לְמִשְׁפָּט כִּסְאוֹת לְבֵית דָּוִיד: ו שַׁאֲלוּ שְׁלוֹם יְרוּשָׁלָם יִשְׁלָיוּ אֹהֲבָיִךְ: 122:5 For there thrones were set for judgment, The thrones of the house of David. 122:6 Pray for the peace of Jerusalem: ‘May they prosper who love you. (NASB) Jerusalem is described as a place of Judgment and also a place of joy. Tehillim / Psalms 122 concludes saying, הז יְהִי-שָׁלוֹם בְּחֵילֵךְ שַׁלְוָה בְּאַרְמְנוֹתָיִךְ: ח לְמַעַן-אַחַי וְרֵעָי אֲדַבְּרָה-נָּא שָׁלוֹם בָּךְ: ט לְמַעַן בֵּית-יְהֹוָה אֱלֹהֵינוּ אֲבַקְשָׁה טוֹב לָךְ: 122:7 ‘May peace be within your walls, And prosperity within your palaces.’ 122:8 For the sake of my brothers and my friends, I will now say, ‘May peace be within you.’ 122:9 For the sake of the house of the Lord our God, I will seek your good. (NASB) This holy city is again called the place of peace and prosperity. This psalm is not speaking of the prosperity gospel, but of finding joy in the Lord and in His promises. In this week’s study from Tehillim / Psalms 122:1-9, the psalm opens saying, א שִׁיר הַמַּעֲלוֹת לְדָוִד שָֹמַחְתִּי בְּאֹמְרִים לִי בֵּית יְהֹוָה נֵלֵךְ: A song of ascents. Of David. 122:1 I was glad when they said to me, ‘Let us go to the house of the Lord.’ (NASB) The Aramaic Targum states the following, א שירא דאיתאמר על מסיקיין דתהומא חדיתי באמרין לי בית מקדשא דיהוה ניזיל׃ 122:1 A song that was uttered on the ascents of the abyss. I rejoiced with those who say to me, “Let us go to the sanctuary of the Lord.” (EMC) David speaks of the joy of going to the house of the Lord. Why is the house of God joyful? We read in the book of Ezra 6:22 And they observed the Feast of Unleavened Bread seven days with joy, for the LORD had caused them to rejoice, and had turned the heart of the king of Assyria toward them to encourage them in the work of the house of God, the God of Israel. (NASB) The people were joyful because of the way the Lord was working in their lives. The thankfulness of Israel was the result of the Lord having turned, the hearts of their civil rulers, whether Assyrians, Babylonians, or Persians, from hostility to friendship, having replaced the bitter enmity of Sennacherib and Nebuchadnezzar by the good-will of Cyrus and Darius. It is in this way we are obligated to recognize the Lord in all His mercies towards us, He has our back. Remember the song, “I was glad when they said unto me, ‘Let us go into the house of the Lord.’ I was glad when they said unto me, ‘Let us go into the house of the Lord.’” What we find here in the Psalm is David proclaiming the joy of going up unto the mountain, of ascending to the house of God. It is interesting today, in our society, many people have decided to stay away from the house of God altogether. The reason being, what they experience there does not make them glad in their hearts. Now when the Psalmist speaks of being glad by going into the house of the Lord, he is not just talking about going to church, but also about going to the sanctuary and participating in worship and the whole fabric of faith and all it encompasses. The joy of the Lord is not just found in a physical house. It should be a part of wherever the God of Israel and His people meet. In this way, even in the absence of the Temple in Jerusalem, we have the ability to be joyful in the Lord. That is what was intended to be an experience of joy. However, many people today cannot truthfully say, “I was glad when they said unto me, ‘Let us go into the house of the Lord.’” The House of God is a place of joy, because it is in this place the people discover that what matters in life is not what they get but the mercy they are given. It is found within the remembering of the Word of God, how the Lord has worked in the lives of His people, that we learn what matters about us is not how high we climb, but how deeply we are loved by God. Note how in the parable Yeshua spoke of the lost brother, that the older brother remained outside the house and outside of being joyful. He did this because he was focusing upon making something of himself with what God had given him, as opposed to remaining in the Lord and being joyful in what the Lord has given us to freely share with others. Yeshua the Messiah lived the Torah of truth, and so we should celebrate the Joy of Torah (Simchat Torah) in our lives. Yeshua, the living Torah, the living Word, which our Father is writing upon our hearts, He does this so we can truly celebrate and embrace the truth that is from the Lord. Yeshua did not come to destroy the Torah, but to fulfill it in our lives (Matthew 5:17-20). This very idea of Jeremiah 31:31-34, of the coming of a day when the Lord will make a new covenant and write his Torah upon our hearts, is the reason we celebrate the Torah as a way of life. The significance of believing in Yeshua and what He has done is found within this Jeremiah text, because he is able to do what Moshe was not able to do, that is to write the instructions of God within our inward parts and upon our hearts so that we might truly be the people of God. In addition, by the means of the sacrificial death, the righteous ruling of life for life atonement is satisfied, and the Lord is glorified as both merciful to us, and just in the sense that He is the justifier of those who put their trust in Him. It is in this mercy of God we are truly able to be joyful in the Lord and sing, “I was glad when they said unto me, ‘Let us go into the house of the Lord.’” The Torah is holy, just, and good (Romans 7:12), but those seeking righteousness based on its demands will discover tragically how powerless we are on our own in this life. Paul wrote that it is sin that imparts our weaknesses, but it is the Lord who is able to empower us to overcome. We are enabled by the Spirit of God, with His Torah written upon our hearts (Hebrews 8:10-11). We no longer seek righteousness by means of maintaining our abilities, but receive the gift of the Messiah who places within us His power and victory, and writes his commands upon our hearts so we are able to live by them. Our trust in the Messiah facilitates our acceptance before our Father in heaven. David continues saying the following, א שִׁיר הַמַּעֲלוֹת לְדָוִד שָֹמַחְתִּי בְּאֹמְרִים לִי בֵּית יְהֹוָה נֵלֵךְ: ב עֹמְדוֹת הָיוּ רַגְלֵינוּ בִּשְׁעָרַיִךְ יְרוּשָׁלָם: ג יְרוּשָׁלַם הַבְּנוּיָה כְּעִיר שֶׁחֻבְּרָה-לָּהּ יַחְדָּו: ד שֶׁשָּׁם עָלוּ שְׁבָטִים שִׁבְטֵי-יָהּ עֵדוּת לְיִשְֹרָאֵל לְהֹדוֹת לְשֵׁם יְהֹוָה: 122:2 Our feet are standing Within your gates, O Jerusalem, 122:3 Jerusalem, that is built As a city that is compact together; 122:4 To which the tribes go up, even the tribes of the Lord An ordinance for Israel To give thanks to the name of the Lord. (NASB) What is the significance of standing within the gates of Jerusalem? What is it about this holy city that is so attractive to all peoples? Have you ever wondered these questions? During King David’s time, there were 9 gates into the city of Jerusalem. Four hundred years later the Babylonian army destroyed the city and left the walls and gates in ruins. The Book of Nehemiah records the rebuilding of the city around 445 B.C. In chapter three, repairs were made to ten gates. They are listed in the order of their locations, beginning with the Sheep Gate near the northeastern reaches of the wall corresponding to the general proximity of the modern Herod’s Gate. Nehemiah lists them in chapter 3. The city gate was part of a city’s protection against invaders and were also places of central activities. According to the Scriptures, it was at the city gates that important business transactions were made, court was convened, and public announcements were made. As a result of these things, the Scriptures speak frequently of “sitting in the gate” and of the activities that took place at the gate. In Mishley / Proverbs 1, wisdom is said to be “At the head of the noisy streets she cries out, in the gateways of the city she makes her speech” (1:21). The reason being is to spread her words in the best possible way and to maximize the number of people that are reached. Wisdom then naturally takes to the gates of the city. The first mention of a city gate in the Torah is found in Bereshit / Genesis 19:1 in Parashat Vayera. Here we find Lot sitting at the entrance to the city discussing or conducting business. In the Torah, we are told in Devarim / Deuteronomy 21:18-21, יח כִּי-יִהְיֶה לְאִישׁ בֵּן סוֹרֵר וּמוֹרֶה אֵינֶנּוּ שֹׁמֵעַ בְּקוֹל אָבִיו וּבְקוֹל אִמּוֹ וְיִסְּרוּ אֹתוֹ וְלֹא יִשְׁמַע אֲלֵיהֶם: יט וְתָפְשֹוּ בוֹ אָבִיו וְאִמּוֹ וְהוֹצִיאוּ אֹתוֹ אֶל-זִקְנֵי עִירוֹ וְאֶל-שַׁעַר מְקֹמוֹ: כ וְאָמְרוּ אֶל-זִקְנֵי עִירוֹ בְּנֵנוּ זֶה סוֹרֵר וּמֹרֶה אֵינֶנּוּ שֹׁמֵעַ בְּקֹלֵנוּ זוֹלֵל וְסֹבֵא: כא וּרְגָמֻהוּ כָּל-אַנְשֵׁי עִירוֹ בָאֲבָנִים וָמֵת וּבִעַרְתָּ הָרָע מִקִּרְבֶּךָ וְכָל-יִשְֹרָאֵל יִשְׁמְעוּ וְיִרָאוּ: 21:18 ‘If any man has a stubborn and rebellious son who will not obey his father or his mother, and when they chastise him, he will not even listen to them, 21:19 then his father and mother shall seize him, and bring him out to the elders of his city at the gateway of his home town. 21:20 ‘They shall say to the elders of his city, ‘This son of ours is stubborn and rebellious, he will not obey us, he is a glutton and a drunkard.’ 21:21 ‘Then all the men of his city shall stone him to death; so you shall remove the evil from your midst, and all Israel will hear of it and fear. (NASB) The parents of a rebellious son were to bring him to the city gate and the elders would pass judgment. The city gate functions is a place of judgment. In the book of Ruth (Ruth 4:1-11), Boaz claimed the position of kinsman redeemer by meeting the people at the gate to Bethlemen. This was the location where the legal rulings for marriage were settled. In 1 Samuel 4:18 we read 4:18 When he mentioned the ark of God, Eli fell off the seat backward beside the gate, and his neck was broken and he died, for he was old and heavy. Thus he judged Israel forty years. (NASB) Eli waited at the city gate for news about the ark of the covenant. When king David stood before his troops, he did so at the city gate (2 Samuel 18:1-5). After his son Absalom died, David mourned but eventually returned to the city gate along with his people (2 Samuel 19:1-8). The king’s appearance at the gate symbolized the mourning was over, and the king was once again attending to the business of governing the people and the land. Note that the importance of the city gate was not restricted to Israel. In Esther 2:5-8 we read that some of the king’s servants plotted at the king’s gate to murder him. Mordecai, a leader of the Jewish people in Persia, heard the plot and reported it to Esther, who gave the news to the king (Esther 2:19-23). The text describes the Persian court officials as being “at the king’s gate” (3:3). The significance of the city gate is found within the promises of God, where the Lord promised to Abraham, “your offspring shall possess the gate of his enemies.” (Bereshit / Genesis 22:17) To control one’s enemies requires one to conquer their city and take captive their gate. In addition to this, Yeshua promised to build the congregation of God’s people (ekklesia) saying, “The gates of Hell will not overcome it.” (Matthew 16:18) This understanding of the biblical implications of “the city gates” helps us to understand David’s words, א שִׁיר הַמַּעֲלוֹת לְדָוִד שָֹמַחְתִּי בְּאֹמְרִים לִי בֵּית יְהֹוָה נֵלֵךְ: ב עֹמְדוֹת הָיוּ רַגְלֵינוּ בִּשְׁעָרַיִךְ יְרוּשָׁלָם: ג יְרוּשָׁלַם הַבְּנוּיָה כְּעִיר שֶׁחֻבְּרָה-לָּהּ יַחְדָּו: ד שֶׁשָּׁם עָלוּ שְׁבָטִים שִׁבְטֵי-יָהּ עֵדוּת לְיִשְֹרָאֵל לְהֹדוֹת לְשֵׁם יְהֹוָה: 122:2 Our feet are standing Within your gates, O Jerusalem, 122:3 Jerusalem, that is built As a city that is compact together; 122:4 To which the tribes go up, even the tribes of the Lord An ordinance for Israel To give thanks to the name of the Lord. (NASB) And helps us to interpret Yeshua’s words. Since a gate was a place where rulers met and counsel was given, Yeshua was saying that all the evil plans of Satan himself would not overcome God’s people. Solomon’s prayer in 1 Kings 8:33-34 speaks of the Temple of God as a place where the God of Israel dwells, and also as a place of worship where all people may come to offer their prayers to God. Could this be why the city of Jerusalem is considered the most important city in all of history? It is important to note Solomon’s prayer also included foreigners who come to the Temple because they are attracted to the religious values of ancient Israel. The morality, righteousness, holiness, and truthfulness of God is said to attract all the nations to the service of the Lord. These things may be the reason for the centrality of the place the Lord has chosen to establish His Name, in Jerusalem, and why the rabbinic traditions also reflect the importance of these things. It is interesting how history bears out in both the Torah and extra-biblical texts that the key to remaining in the Land, and remaining in God’s favor was for the children of God to choose to keep their covenant with God through repentance. The key to Israel’s future, and our future, is found in repentance, to recognize our sin, to turn from our sin, and to seek the forgiveness of God for our sins. The book of 2 Maccabees 5:19-20 speaks of Israel being punished due to her sins. This follows from the Torah perspective that seeks the future of God’s people as being depending upon repentance and obedience. Jerusalem, that holy city plays a central roll in the joy of the Lord as David says, 122:4 To which the tribes go up, even the tribes of the Lord An ordinance for Israel To give thanks to the name of the Lord. (NASB) This place of worship is important, but is not essential to live as it is to be obedient to the Torah of God, to seek His ways in order to live for Him, and to repent of our sins. The love and loyalty of the people to Jerusalem are coupled to this concept of repentance and forgiveness and the Love of God, as it is described in the righteousness, holiness, and truthfulness of god, and the moral life of the believer. As a result, the city, and Jerusalem have a central place in the hearts of all God’s people, as the city in which God chose to establish His Name and His presence. The restoration of God’s people to Jerusalem is dependent upon their commitment to the Torah, and love for the Lord God in heaven. In Matthew 5 Yeshua said that he did not come to abolish the Torah. In Matthew 23:1-3 he told the crowd and His disciples that the scribes and Pharisees sit in Moshe seat, therefore do and observe all that they tell you to do. In Matthew 28:18-20 Yeshua gave the disciples the great commission to go into all the world teaching them to do all that He had commanded them to do. Some may say that these things were for the early Church only. The prophet Isaiah states otherwise saying, Isaiah 2:1 The word which Isaiah the son of Amoz saw concerning Judah and Jerusalem. 2:2 Now it will come about that In the last days The mountain of the house of the Lord Will be established as the chief of the mountains, And will be raised above the hills; And all the nations will stream to it. 2:3 And many peoples will come and say, ‘Come, let us go up to the mountain of the Lord, To the house of the God of Jacob; That He may teach us concerning His ways And that we may walk in His paths.’ For the law will go forth from Zion And the word of the Lord from Jerusalem. (NASB) Isaiah says in the later days the Torah will go forth from Zion. Based upon these Scriptures and more, we are still to do our best to following God’s instructions that He had given us from heaven in order to live life to the fullest. David continues saying, כִּי שָׁמָּה | יָשְׁבוּ כִסְאוֹת לְמִשְׁפָּט כִּסְאוֹת לְבֵית דָּוִיד: ו שַׁאֲלוּ שְׁלוֹם יְרוּשָׁלָם יִשְׁלָיוּ אֹהֲבָיִךְ: 122:5 For there thrones were set for judgment, The thrones of the house of David. 122:6 Pray for the peace of Jerusalem: ‘May they prosper who love you. (NASB) Jerusalem is described as a place of Judgment and also a place of joy and peace. Tehillim / Psalms 122 concludes saying, הז יְהִי-שָׁלוֹם בְּחֵילֵךְ שַׁלְוָה בְּאַרְמְנוֹתָיִךְ: ח לְמַעַן-אַחַי וְרֵעָי אֲדַבְּרָה-נָּא שָׁלוֹם בָּךְ: ט לְמַעַן בֵּית-יְהֹוָה אֱלֹהֵינוּ אֲבַקְשָׁה טוֹב לָךְ: 122:7 ‘May peace be within your walls, And prosperity within your palaces.’ 122:8 For the sake of my brothers and my friends, I will now say, ‘May peace be within you.’ 122:9 For the sake of the house of the Lord our God, I will seek your good. (NASB) This holy city is again called the place of peace and prosperity. This psalm is not speaking of the prosperity gospel, but of finding joy in the Lord, in His commandments, and in His promises. This psalm speaks to our helping others to become more like Yeshua, and He was, is and forever will be a Torah keeping rabbi, where the goal of every Believer is to become more like Yeshua every day. What we are learning here today, is that if we want the best for our families, then we ought to live by God’s Torah. The reason these things are true, is the Torah lays down a system of holidays that remind us throughout the year of the Lord and the great love that He has for us. The Torah is a health manual, both spiritually and physically. The Torah is a marriage manual, how to treat one another and how to show our love for one another. The Torah describes how we should raise our family (see Devarim / Deuteronomy 4-10). The Torah describes how we are to treat our friends,strangers, and even our enemies. The Torah is a business manual (having just scales), and teaches us extensively about times of war. We are given instruction on how to fear and respect the Lord, how to take care of ourselves, personal hygiene and food, and how we relate to our spouses, children, servants, and workers. There are too many verses to reference here from the Torah to provide all of the examples, because from cover to cover the five books of Moshe details all of these things. Yeshua said the two most important commands, Love God with all your heart, and love your neighbor as yourself. He focused upon these three areas of the Torah and if we succeed in them we have fulfilled the Torah (lived it). Paul’s writings further clarify what Yeshua taught. Paul reinforces a central tenant of the Torah in the covenant relationship, that a spouse is bound to the other spouse by the covenant of blood until one of them dies, then the marriage covenant is no longer in place. Similarly, a person dies to sin as being in Yeshua the Messiah, and the new master (Yeshua) takes over and we live according to the Spirit. The point is that every person who has the expectation of eternal life in the Kingdom of God, and wants to enjoy a good, healthy and prosperous life now, ought to do the best to follow the Creator’s instructions. The bottom line is, the more of the Torah we succeed to keep, the better our life will be and the better life will be for every one around us. It is also only with God’s help that we are able to do as He wants, to walk according to the Spirit. The commands were given to us in order to humble our lives for the glory of God. Instead of arrogantly declaring that we are “not under the law, but under grace,” which is an insult to the grace and goodness of God in His Word, we are to humble our lives, and to seek first His kingdom according to the commandment. He is looking for His sons and daughters to have the correct heart attitude towards His Torah, and like King David, thank Him and praise Him for giving us His perfect instructions, and to do the best we can to live by them. And when we fail, we get back up, repent, and continue to walk in the Spirit with the help of the Lord. 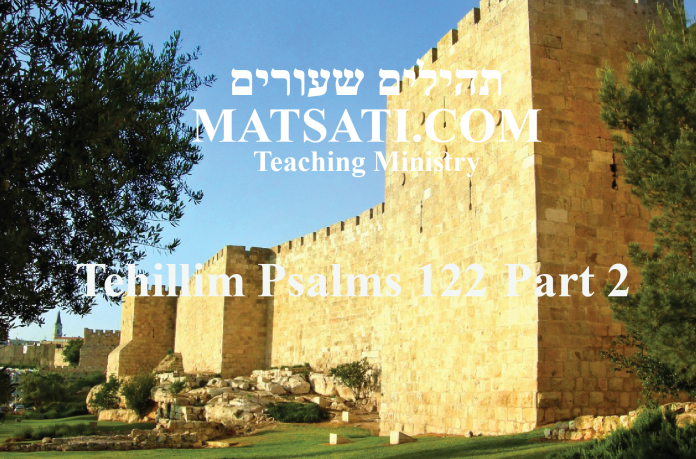 The Rabbinic Commentary (Midrash) on Tehillim / Psalms 122 has 7 parts. Reading through the Midrash we will be looking at Part 1, 2, 3, 4, and 5. Let’s begin by outlining Midrash Tehillim Chapter 122, Parts 1, 2, 3, 4, and 5. The משל (mashal) “the parable,” goes on to explain the פתיחתא (Petihta), the rabbis speak of going up to the house of the Lord. The נמשל (Nimshal) “expansion on the parable” expands upon the משל (mashal), with a discussion on men speaking of looking forward to the death of David. The משל (mashal) “the parable,” goes on to explain the פתיחתא (Petihta), the rabbis discuss speak of being a scoffer because the Temple is not built. The נמשל (Nimshal) “expansion on the parable” expands upon the משל (mashal), with discussion on being joyful regardless of what others say to us. The משל (mashal) “the parable,” goes on to explain the פתיחתא (Petihta), the rabbis speak of standing at the gates of Jerusalem. The נמשל (Nimshal) “expansion on the parable” expands upon the משל (mashal), concluding that those who stood at the gates to Jerusalem occupied themselves with the Torah. The נמשל (Nimshal) “expansion on the parable” expands upon the משל (mashal), with discussion on the Torah as a way of life, and the Lord causing His presence to rest in the place. The משל (mashal) “the parable,” goes on to explain the פתיחתא (Petihta), the rabbis speak of morality having a very important place in the life of the believer. The נמשל (Nimshal) “expansion on the parable” expands upon the משל (mashal), with discussion on the virtues of morality and the covenant relationship. א שיר המעלות לדוד שמחתי באומרים לי בית ה׳ נלך. אמר רבי יהושע בן לוי אמר דוד [לפני הקב״ה רבש״ע] שמעתי בני אדם (שהם) [שהיו] אומרים מתי ימות זקן זה ויבא שלמה בנו ויבנה בית הבחירה ונעלה לרגל ושמחתי, אמר ליה הקב״ה טוב יום בחצריך מאלף (תהלים פד יא), טוב לי יום אחד שאתה עוסק בתורה, מאלף עולות שעתיד שלמה בנך להקריב לפני על גבי המזבח. 1. A song of ascents, of David. I rejoiced when they said unto me, Let us go unto the house of the Lord (Tehillim / Psalms 122:1). Rabbi Joshua son of Levi taught that David said to the Holy One blessed be He, Master of the Universe, I have heard men say, When will this old man die, so that Solomon his son will come and build the appointed shrine to which we will ascend in pilgrimage? Nevertheless, I rejoiced despite what they said because the Holy One blessed be He, assured me, A day in your courts is better than a thousand years elsewhere (Tehillim / Psalms 84:11), that is, I prefer a single day in which you occupy yourself with Torah to the thousand burnt offerings which your son Solomon will offer up before Me on the altar. The midrash speaks of men looking forward to the time when David would die. Do you think these men were actually considering the timing of the building of the Temple in Jerusalem when looking fotward to David’s death? These evil men might have thought about taking the throne or some how influencing his son Solomon to do their biding, so they looked forward to David’s death. In Philippians 1, we read of Paul writing about death and life in the following way. A commonly cited text from Philippians chapter 1 seems to imply that we are immediately brought before our Father in heaven, into His presence when we die. On the surface this gives the impression that the life after death is superior to the life we have now. The idea is that death and dying are somehow preferable to staying alive. People who fear death and the afterlife have found comfort in these verses, because the apostle Paul himself seems to struggle between a desire to live and his desire to die. In order to properly evaluate the meaning of this passage, we must remember the text should be read within the context of what Paul is trying to say. The verses immediately preceding these verses are very important to our understanding Philippians 1:21-23. Philippians 1:20 states that Paul wishes to live for the Lord whether in the body, or in death (meaning that he had finished well and maintained the faith). He says that his preference is to be in the presence of God, that he expects to magnify the Messiah in bodily form. We must be careful when studying the Scriptures to not come up with the idea that death brings something superior to life. True the resurrection body will be incorruptible meaning that it will not grow old and die or be touched by sin. Death is the absence of life, it is the result of sin, and if we believe that death brings a privileged kind of afterlife, we are following a false doctrine. Paul was not speaking of life after death in the sense of our continuing on in an immediate, spiritual form as a soul without a body by reminding us that Paul expects to meet God in his own body at a future time. 1 Thessalonians 4:13 But we do not want you to be uninformed, brethren, about those who are asleep, so that you will not grieve as do the rest who have no hope. 4:14 For if we believe that Jesus died and rose again, even so God will bring with Him those who have fallen asleep in Jesus. 4:15 For this we say to you by the word of the Lord, that we who are alive and remain until the coming of the Lord, will not precede those who have fallen asleep. 4:16 For the Lord Himself will descend from heaven with a shout, with the voice of the archangel and with the trumpet of God, and the dead in Christ will rise first. 4:17 Then we who are alive and remain will be caught up together with them in the clouds to meet the Lord in the air, and so we shall always be with the Lord. (NASB) Paul expects to meet the Lord in his own body, at which time he will be resurrected in bodily form to always be with the Lord, as these passages are describing. Paul did not look forward to death. Death is not a reward. Rather, he looked forward to the day he would rise again, with an incorruptible new body, to be with the Messiah Yeshua and the family of God. He simply knew that he must first “depart” from this life to await his new one. The rabbis speak of seeking the death of David in order to see the Temple of God being built by Solomon. This concept of death and seeing God appears to be the point that is being drawn out in the midrash. The rabbis speak of the death of David and the ascension of the people. Somehow, the people will ascend to another level of spirituality through the death of David, the life of Solomon, and the building of the Temple. Midrash Tehillim 121 Part 1 concludes saying, “Nevertheless, I rejoiced despite what they said because the Holy One blessed be He, assured me, A day in your courts is better than a thousand years elsewhere (Tehillim / Psalms 84:11), that is, I prefer a single day in which you occupy yourself with Torah to the thousand burnt offerings which your son Solomon will offer up before Me on the altar.” Regardless of what is on men’s hearts, whether to do us harm or for our prosperity, we rejoice in the Lord. Rejoicing is paralleled to occupying ourselves with the Torah. The reason being, our occupying ourselves in God’s Word places His word in our hearts, and its application in our lives. This demonstrates the motivation to seek the Lord and to do what is right. 2. No generation is without its scoffers. What did the impudent men of David’s generation do? They used to walk by David’s windows and say to him, David when will the Temple be built? And when will you go unto the house of the Lord? And David would say to himself, Even though they intend to provoke me, I swear that what they ask makes me rejoice in my heart. Hence, he said, I rejoiced when they said unto me, Let us go unto the house of the Lord. We are told the scoffers will reject creation, reject the Flood of Noah’s Day, and reject the coming judgment by fire. The passage in 2 Peter 3 is the perfect description of those in today’s world who have adopted the religion of evolution and attempt to brainwash generations of students to deny the existence of the Creator God. I say “religion of evolution” because it is a matter of faith to believe in the evolution of species to arrive where we are today in creation. In this theology of evolution, they teach instead that natural processes over eons brought the universe and all life into existence which is a form of pantheism. These scoffers (mockers) teach that the world has continued on and on for millions of years without any intervention by an all-powerful God. Peter goes on to warn, saying “Beware lest you also fall from your own steadfastness, being led away with the error of the wicked” (2 Peter 3:17). The scoffers will try to get each one of us to fall in our faith and to reject the truth of Creation, the Flood, and the coming judgment. In the midrash, these scoffers would walk by David’s house and ask him when the Temple would be built. The question was of a matter of faith, right? If David gave in to the scoffers claims and started to build the Temple going against God’s Word, he would have sinned. Our faith calls us to stand strong in the Word of the Lord, to not doubt, and to obey. This is what Paul meant when he said over and over again of the obedience of the faith to the Romans 15:14-22, the gospel is connected to obeying God. This is why Paul has been hindered from coming to the Romans as he states, because the obedience of the gospel is vitally important. And Romans 16: 17-25 Paul reiterates the importance of the gentiles coming to the obedience that comes from faith. This stands against the faith alone theologies of today. Midrash Tehillim 122 Part 2 concludes saying, “And David would say to himself, Even though they intend to provoke me, I swear that what they ask makes me rejoice in my heart. Hence, he said, I rejoiced when they said unto me, Let us go unto the house of the Lord.” Note how David says he will rejoice in his heart regardless of what others say. We need to heed the example that David lived in maintaining the faith. In today’s world, the scoffers have caused many young people to fall by rejecting the truth of God through the secular education system. Many of God’s people today have been lulled into complacency while the scoffers have captured the hearts and minds of God’s people through sly secular teachings. One of the most detrimental influences on young people today is the philosophy that things continue as they always have since the beginning. Peter makes this point by summarizing the teaching in his day that the universe has continued on until this day forever, the teaching of which has not changed following centuries of scientific advancement which states the world has evolved slowly by natural processes over billions of years. However, the real reason the God of Israel is delaying on the return of the Messiah, for what seems a long time (2,000 years), is found within His patience and long-suffering. He is “not willing that any should perish but that all should come to repentance” (2 Peter 3:9). This is a Torah centric principle Peter is teaching here on the long suffering nature and the love of God towards His people, one of which He seeks for our repentance to turn from our sinful ways to His ways of righteousness, holiness, justice, and truth. The very idea of “faith” calls us to reject the philosophy of the scoffers and be diligent to spread the wonderful message of salvation for all to hear and respond to. ג עומדות היו רגלינו בשעריך ירושלים. אמר ר׳ יהושע בן לוי מי גרם לרגלינו שיעמדו במלחמה, שערי ירושלים שהיו עוסקים בהם תורה. 3. Our feet stood because of your gates, O Jerusalem (Tehillim / Psalms 122:2). Rabbi Joshua son of Levi said, What made our feet stand firm in war? The gates of Jerusalem, where we occupied ourselves with Torah. What we find here in the midrash is the rabbis speaking of the power of the city, as referring to the gates upon which our feet stand having the ability to cause us to stand firm during a time of war. Midrash Tehillim 122 Part 3 concludes saying, “The gates of Jerusalem, where we occupied ourselves with Torah.” In Parashat Noach, following the flood, the Torah tells us that the people of Shinar decided to build a tower, known as the “Tower of Babel.” Our sages explain that the building of this tower occupied the minds and hearts of the people so completely that it caused them to be un-attentive and uncaring in regard to the needs of one another. This was coupled to their wanting to establish a name for themselves in the heavens as god. The people of Shinar forgot the foundation of faith that is established upon justice and mercy. Throughout the centuries, Judaism has taught the values of justice and mercy as it is expressed in the Torah. The student learns the Torah means “instruction” as it is God’s loving instruction for His people that is the solid foundation of our lives. The Torah functions as a guide and wedding vows of the sacred marriage between the God of Israel and His people. This is why in the Targum Jonathan ben Uziel, Vayikra / Leviticus 19:18 (“And you shall love your fellow as yourself.”) is expanded upon to say, “And you should love your fellow. What you dislike for yourself do not do to another person.” This corresponds to the famous words of Hillel related in the Talmud Bavli Shabbat 31a when a gentile came to him and requested that he be converted to Judaism on the condition that he be taught the whole Torah while standing on one leg. Hillel understood this prospective convert was very serious about his commitment and said to him, “What you don’t want for yourself, don’t do to your fellow. This is the foundation of the whole Torah; the rest is its commentary. Go and study.” Rabbi Akiva alluded to the fundamental importance of this commandment of which Rashi also concludes in his commentary saying that this commandment is a major teaching in the Torah. In Ephesians 6:11-17 Paul instructs believers to “put on the whole armor of God” as a defense against Satan’s attacks. This armor includes the belt of truth, the breastplate of righteousness, the shield of faith, the helmet of salvation, and the sword of the Spirit. Paul uses the analogy of the Roman soldier’s footwear to tell us about the next piece of armor God has given to us so that we can fight the spiritual battle we are in. This is related to our standing in the gates of Jerusalem, and standing firm in our faith. Paul says in verse 6:15 that we are to have our feet “shod with the preparation of the gospel of peace.” Shoes are meant for moving. The Lord God expects us to go bringing His message of the Torah and of His salvation to others. First Peter 3:15 states, “Always be prepared to give an answer to everyone who asks you to give the reason for the hope that you have.” When we share our faith, we dig into God’s word and are set upon a solid foundation of God’s Word. What Paul is speaking of is being prepared because we are in a spiritual war. Three times he says that we are to “stand firm against the schemes of the devil” (6:11); “and having done everything, to stand firm” (6:13); “Stand firm therefore” (6:14). The analogy of having our feet shod is so that we can resist and stand firm when we are attacked. This is why standing firm in war is paralleled to the gates of the city, and to the study of the Torah. In order to withstand the attacks of the enemy, we do so by protecting our feet, that upon which we stand, remain in the faith, and study Scripture. It is in this way our feet will surely keep from slipping. Note what Paul is speaking of, We are to have our feet shod, but with what? He says it is the preparation of the gospel of peace. This gospel of peace is what we are learning in the Torah in relation to Vayikra / Leviticus 19:18 to love your brother as yourself. ד ירושלים הבנויה. א״ר יוחנן אמר הקב״ה לא אבוא בירושלים של מעלה, עד שאבוא לירושלים של מטה (שנאמר בקרבך קדוש ולא אבוא בעיר (הושע יא ט)), ומי איכא ירושלים למעלה, אין דכתיב ירושלים הבנויה כעיר שחוברה לה יחדו. א״ר יהושע בן לוי עיר שהיא עושה כל ישראל חברים, מעתה אפילו בשאר ימות השנה, א״ר זעירא ובלבד [בשעה] ששם עלו שבטים שבטי יה עדות לישראל. (אמר רבא אמר רב אדא) [אמר ר׳ אבין בר רב אדא] אמר רב כל הנושא אשה שאינה הוגנת לו כשהקב״ה [משרה שכינתו] מעיד על [כל] השבטים ואין מעיד עליו, שנאמר ששם עלו שבטים שבטי יה עדות לישראל, אימתי עדות לישראל, בזמן שהשבטים שבטי יה. 4. Jerusalem, that are built (Tehillim / Psalms 122:3). Rabbi Johanan taught that the Holy One blessed be He, said I will not enter into the heavenly Jerusalem until I can enter the earthly Jerusalem, for it is said, until the holy one is built in the midst of you, I will not enter into the city (Hosea 11:9). But is there a heavenly Jerusalem? Yes! For it is written Jerusalem, that are built as a city bound by fellowship to the other (Tehillim / Psalms 122:3). Rabbi Joshua son of Levi took these words to mean that Jerusalem is a city which makes all Israel into a fellowship. For all the days of the year? Only, said Rabbi Ze’era, when The tribes go up to avow the name of the Lord (Tehillim / Psalms 122:4). Rabbi Avin son of Rab Ada taught in the name of Rab, At the time that the Holy One blessed be He, causes His presence to rest on Israel and testifies to the tribes being His people, He will not testify concerning a man who marries a woman of base origin, for it is said, The tribes go up, the tribes of the Lord, when the testimony is that they are of Israel (Tehillim / Psalms 122:4). And on what rests the Lord’s Testimony that they are of Israel? It rests on their being tribes of the Lord. The rabbis are discussing the Torah as a way of life, and the Lord causing His presence to rest in the place of His choosing. They begin with asking whether there is a heavenly Jerusalem? The proof text is from Tehillim / Psalms 122:3. The Masoretic Text states, ג יְרוּשָׁלַם הַבְּנוּיָה כְּעִיר שֶׁחֻבְּרָה-לָּהּ יַחְדָּו: 122:3 Jerusalem, that is built As a city that is compact together; (NASB) The Aramaic Targum states, ג ירושלם דמתבניא ברקיעא היך קרתא דאתחברא לה כחדא בארעא׃ 22:3 Jerusalem that is built in the firmament is like a city that has been joined together on earth. (EMC) The Targum translation speaks of building Jerusalem in the firmament that is joined with the city here on earth. This is paralleled to the presence of God who dwells in heaven and His presence on earth which is connected to Torah observance. It is the unfortunate case that in much of evangelical Christianity the Tanach (OT) is hardly taught, rarely preached on and little understood by the average person. Where the Torah (Law) is mentioned, it is often portrayed as merely a burden from which Christians are now free. The biblical picture of the Torah however is quite different. The Torah in the Tanach is spoken of as the loving instruction and gift from God, a guide for life, something to be cherished and enjoyed, as well as something to be obeyed under penalty of punishment for disobedience. It is intimately bound to the covenant wherein the God of Israel graciously reiterated His relationship with His people. Wisdom as it is described in the Tanach is the skill of living according to God’s moral code, and the Lord is said to dwell within the believer to help him live according to His ways. The wise person is said to live in God’s ways which are intended for life. True wisdom which the Apostle James speaks is from “above,” from the Lord God in heaven. (James 3:17) The Lord gives wisdom (Mishley / Proverbs 2:6), and when wisdom is personified in the proverbs, she is said to have helped to shape creation (Mishley / Proverbs 8:22-31). This shaping and creating becomes a part of our lives in order to help us to shape and create mercy and blessings towards others. This is described as wisdom being the companion with the Lord during the creation. The rabbis believed that wisdom must be connected to Torah so that Torah observance is wisdom in the life of God’s people. So when James states that wisdom is “from above” he is referring to “the heavens” to say that not only is wisdom from heaven, but that we walk in heavenly places as a result of our ordering our lives in accordance with God’s Word. We know God and He knows us because we walk in His ways. This is the meaning of the abiding Yeshua spoke of that is required from His people. (John 15) The rabbis connect the wisdom of God to the Torah, we understand this from the Zohar in the sense of how the Lord looked into the Torah in order to create the world. What is interesting is how wisdom is personified as being with God in the beginning according to Solomon, and how the Scriptures suggest this wisdom was not only involved in the creation, but also sent to dwell among men. Judaism connects the Spirit of God to wisdom in His Torah according to Rabbi Abraham Joshua Heschel. The word Torah is used in two senses; the supernal Torah, the existence which preceded the creation of the world, and the revealed Torah. Concerning the supernal Torah the Rabbis maintained: “The Torah is hidden from the eye of all living…Man knows not the price thereof.” “Moses received Torah” but not all of the Torah “at Sinai.” And not all that was revealed to Moses was conveyed to Israel; the meaning of the commandments is given as an example. Together with the gratitude for the word that was disclosed, there is a yearning for the meaning yet to be disclosed. There is a theory in Jewish literature containing a profound parabolical truth which maintains that the Torah, which is eternal in spirit, assumes different forms in various eons. The Torah was known to Adam when was in the Garden of Eden, although not in its present form. Commandments such as those concerning charity to the poor, the stranger, the orphan, and the widow, would have been meaningless in the Garden of Eden. In that eon the Torah was known in its spiritual form. Just as man assumed a material form when he was driven out of the Garden of Eden, so has the Torah assumed a material form. If man had retained “the garments of light” his spiritual form of existence, the Torah, too, would have retained its spiritual form. The rabbis speak of the Torah having both spiritual and physical forms. Notice how in the Zohar 1:134a, the rabbis say the Lord God had already created Teshuvah (Repentance) before the creation of the world. Note how the Torah describes the methodology for repentance, and so if the Torah preceded the creation, so does repentance. The wise man who studies the Torah understands the importance for repentance because we all fall short of God’s instruction. The Torah and the working of the Spirit go hand in hand. Judaism connects the Spirit to wisdom, as it is connected to following (walking in) the ways of God. Note how in Bereshit / Genesis 41:38-39 Pharaoh observed the magnitude of Joseph’s wisdom and the presence of God’s Spirit that dwelled within him. This same connection may be made when looking at Bezalel who is said to have combined wisdom and the presence of the Spirit in his life that enabled him to create all of the vessels and everything for the tabernacle (see Shemot / Exodus 31:1-11). Moshe tells us in Devarim / Deuteronomy 34:9 that Joshua was filled with the “Spirit of wisdom.” So wisdom is something to be sought after; it is given by the power of God through His Spirit, and it is necessary to study God’s Word in order to obtain. Midrash Tehillim 122, Part 4 concludes saying, “And on what rests the Lord’s Testimony that they are of Israel? It rests on their being tribes of the Lord.” The Greek word for preparation (hetoimasia), refers to being in the condition of readiness or preparedness. Its cognate term is used in Titus 3:1, “Remind them to be subject to rulers, to authorities, to be obedient, to be ready for every good deed…” We are called to be prepared for what comes our way in this world which is the point of bearing the testimony of God in our lives. For example, a good pair of shoes allows a soldier to be ready for conflict. In the same way we are to be prepared for a spiritual battle by studying God’s Word, establishing God’s Word in our hearts and our lives (i.e. having our shoes on) and being at peace trusting and resting in the Lord and His Messiah Yeshua. With these things we are read and prepared to give an answer to those who ask us about why we live our lives the way we do. ה ד״א [שבטי יה עדות לישראל]. אמר הקב״ה שמי מעיד על ישראל שלא נטמאו במצרים בזנות, ומנין שלא נחשדו על העריות, שנאמר ויצא בן אשה ישראלית (ויקרא כד י), להודיע שבחן של ישראל שלא היה ביניהם אלא זו בלבד ופרסמה הכתוב, ומפורש בקבלה גן נעול אחותי כלה (שה״ש שיר השירים ד יב), אלו הזכרים, גל נעול מעין חתום (שם שם שיר השירים ד׳ י״ב) אלו הנקבות. ורבי נתן אומר, גן נעול אלו הנשואות, גל נעול מעין חתום, אלו הארוסות. ד״א גן נעול גל נעול, [אלו] שתי ביאות. 5. Another reading, the tribes of the Lord (YH), when the testimony was that they were of Israel. The Holy One blessed be He, said, With My name I testify of the tribes of Israel that in Egypt they did not defile themselves by whoring. And whence do we know that they were not even suspected of wantonness? Because it is said that The son of an Israelitish woman, whose father was an Egyptian, when out among the children of Israel (Vayikra / Leviticus 24:10); thereby Scripture makes known the virtue of Israel, for there was only one such wanton woman among them, and Scripture is careful to publish her name. The virtue of Israel is clearly asserted in post-Mosaic Scripture, A garden barred is My sister, My spouse; a spring shut up, a fountain sealed (Song 4:12). By a garden barred it is meant that there was no pederasty; by a spring shut up, a fountain sealed it is meant that there was no fornication. According to Rabbi Nathan, the garden barred stands for the married woman of Israel, and the spring shut up, a fountain sealed stands for the betrothed woman of Israel. Another comment, A garden barred is my spouse and A spring shut up refers to two modes of cohabitation, one natural, and the other, unnatural. Brotherly love and harmony begin with the “great axiom of the Torah,” namely, “Love your neighbor as yourself.” As my father-in-law, the Rebbe would say: Love of a fellow Jew should even extend to a Jew on the other side of the world – even to someone you have never seen. And when you have an opportunity to do a favor — materially or spiritually — for this Jew, you should do it freely and with a joyful heart.… When there is harmony amongst Jews (in addition to the harmony of a Jewish home — and preceding that, a Jew’s inward harmony — between his two inclinations), then there is peace and harmony in the entire world — especially, “peace in the land” — the Land of Israel. Note that Yeshua the Messiah took this to the next level in the sense that we are not to simply love our brother, but we are also called to love our enemies too. Midrahs Tehillim 122 Part 5 concludes saying, “The virtue of Israel is clearly asserted in post-Mosaic Scripture, A garden barred is My sister, My spouse; a spring shut up, a fountain sealed (Song 4:12). By a garden barred it is meant that there was no pederasty; by a spring shut up, a fountain sealed it is meant that there was no fornication. According to Rabbi Nathan, the garden barred stands for the married woman of Israel, and the spring shut up, a fountain sealed stands for the betrothed woman of Israel. Another comment, A garden barred is my spouse and A spring shut up refers to two modes of cohabitation, one natural, and the other, unnatural.” We are described as being a garden barred and a spring shut up as we are married to the Lord in a covenant relationship that separates us from the ways of the world, to forsake immorality, idolatry, murder, and baseless hatred. Our relationship with the Lord breaks down the enmity that is between men, just as the rabbis say that enmity that is between the two inclinations within a man (yetzer hara and tov). The Lord brings peace to men, and this is the peace of the gospel that is spoken of, our being reconciled to the Lord God our Father in heaven through Yeshua the Messiah. Romans 5:1 states, “Therefore having been justified by faith, we have peace with God through our Lord Jesus Christ.” This same comment is made in Ephesians 2:14-18, “2:14 For He Himself is our peace, who made both [groups into] one, and broke down the barrier of the dividing wall, 2:15 by abolishing in His flesh the enmity, [which is] the Law of commandments [contained] in ordinances, that in Himself He might make the two into one new man, [thus] establishing peace, 2:16 and might reconcile them both in one body to God through the cross, by it having put to death the enmity. 2:17 And He came and preached peace to you who were far away, and peace to those who were near; 2:18 for through Him we both have our access in one Spirit to the Father.” Paul speaks of enmity between God and man (2:16) which is created due to our sins. The Lord God gave us the way out, faith in the Messiah followed by repentance and walking in His ways. This is the message of peace that was brought, to love one another, and is the message Yeshua taught to love not just your brother but also your enemies. As we mature in the Messiah, our minds are renewed through the Scriptures, this gospel of peace takes control of our lives because we are in a right relationship with the God of Israel. Everything stems from this point. I have peace because I trust in the Lord God, and I can trust the Lord and His Messiah Yeshua because He has proven His everlasting love for me. This is what Paul taught according to Romans 8:32 saying, “He who did not spare His own Son, but delivered Him up for us all, how will He not also with Him freely give us all things?” Let’s Pray! Parashat Vayishlach, The Revelation of the Messiah according to the Scriptures.